'Flight of Dragonflies' - The simple delight of watching dragonflies perform their aerial magic over a quiet pond is captured here in this exquisite piece. 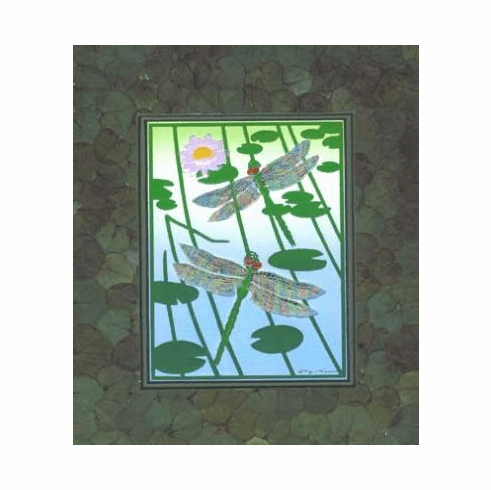 Lilypads and flowers intertwine with pond reeds as the surface of the pond reflects a clear summer sky with our intricately etched dragonflies resting on the reeds. Each vein in the dragonfly's wings has been painstakingly engraved, the wings are then finished in a holographic multicolored application resembling the sun reflecting on their surface. Complete with a handmade real eucalyptus leaf mat. Mat size is 8" x 10", Image 4-1/2" x 6".